What have Peacestreet to do with Skasplash? Without Peacestreet I would never be a part of the Skasplash. 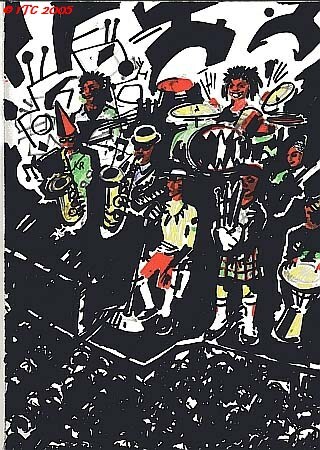 Our band is called “Peacestreet” 1990-1995 (take a look at rootsconnection.ch) (Simon [drums], René [bass], Nonsi [guitar] and I [flute, trombone] are still together as part of Der Transformer). There is one release of Peacestreet on the Benno Riedmann compilation “Skampler 2” and we play shows all around Switzerland. 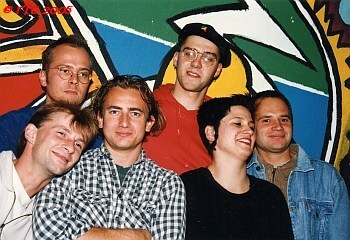 But the source of our band’s name is the flat René rent from 1989-1996. Located at Friedenstrasse 5 (Friedenstrasse means street of peace). 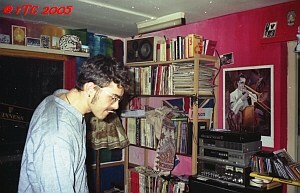 In this flat, we host many of our friends and also all the bands I invited for The Roots Connection events (The Selecter, Laurel Aitken, The Trojans, Bim Skala Bim, Messer Banzani and many others). This flat “Peacestreet” is also our bands rehearsal place for more than two years. 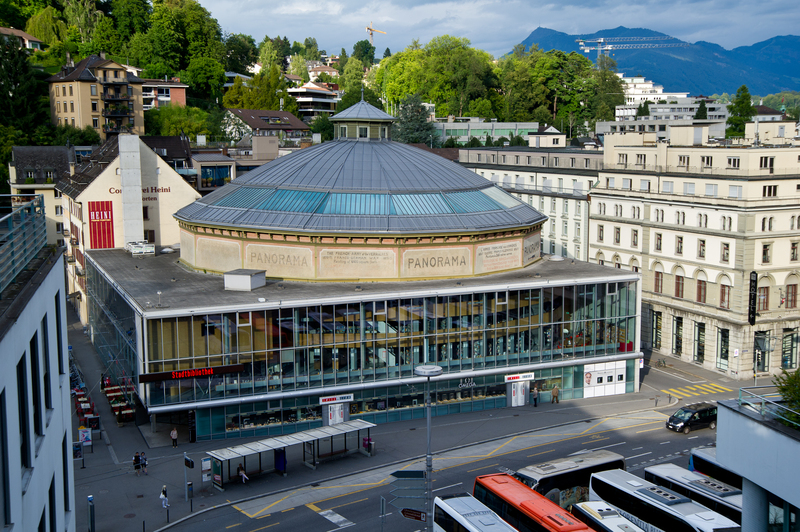 Located inside the touristic center of Lucerne docked on the historic Bourbaki Panorama close to the lions monument. And we lived on the fifth floor as the only living party in this building, because all other floors are used for business only. It is also the host for The Roots Connection from 1994-1996. Various painters produced unique paintings on the walls. And why this post is released today? Because today 20 years ago, we’re celebrating the end of our beloved home. 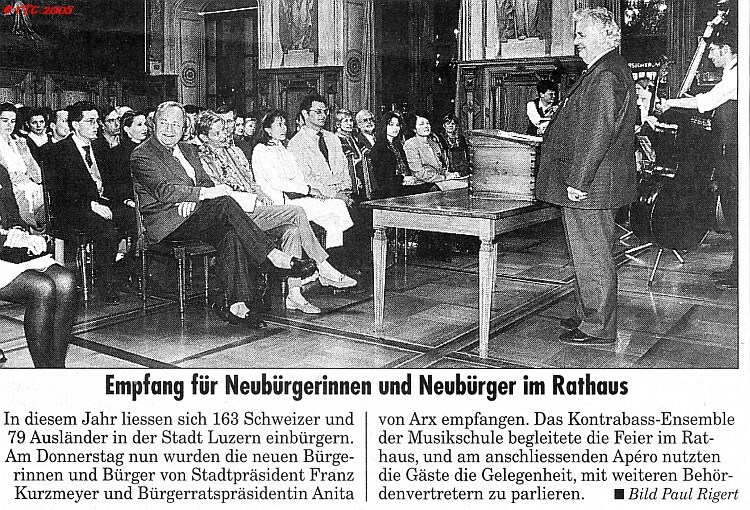 It is some years earlier, when the Attorney for Lucerne city hold his memorable speech about his last wish. He wants to realize a new Bourbaki Panorama. In fact, it is only our house at Friedenstrasse 5, that he wants to destroy. His speech is backed by the KontraSbass Ensemble, with René on bass. He is so close to tell the man, that he’s speaking about his home. 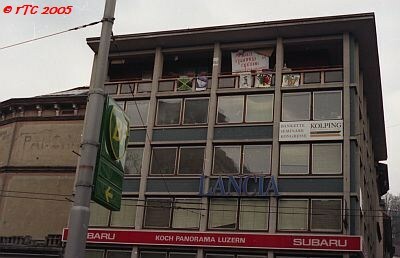 On september 14 in 1996 we have our very last party in our home at Friedenstrasse 5. More about our house and our guests is documented on this page here. More about the last event in our house is documented on this page here. That last event is full of music. At that time there is “The Shame and Skandal family” our bands name. This group is playing in the living room. Beside of that concert, there is my music I c-lect all the day and all the night (I remember René and I went to the Restaurant Rebstock at about 10 o’clock in the morning to finish that party). More about “The Shame & SKAndal Family“. I wasn’t really part of this band, but in the background, there is Nonsi and René from Der Transformer. The house today is a museum. But the part of it, where we were living is cut away. In the last days of our house, we had some posters outside the balcony. And here are some pictures with a special background to the Skasplash or The Roots Connection or Peacestreet. 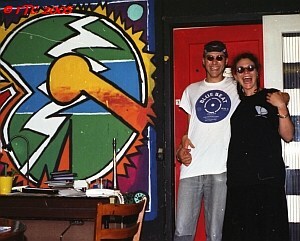 I meet Juliette the year before (1995) in Montpellier with The Skatalites. She comes to Lucerne and lives a few days at Peacestreet. In Paris I meet her again as guest of the Skasplash. 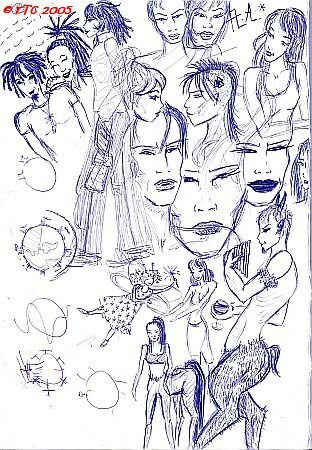 Here are some of here paintings she did in our guestbook. 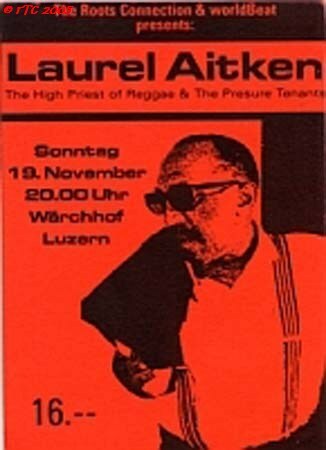 Laurel Aitken came to Lucerne two times for The Roots Connection. In 1990 I went to Thun with my bicycle to meet Vin, his manager for the first time. I asked Vin to bring Laurel Aitken to Lucerne. 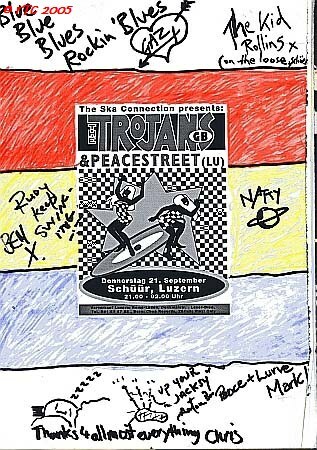 He called me back a few weeks later to offer me The Selecter for their first show in Lucerne. Pauline Black was surprised to play at Sedel with real living cows outside the venue and in a real ex-women’s prison. 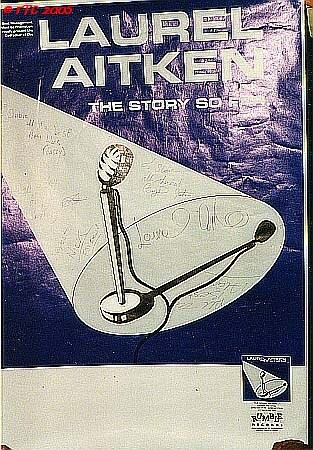 Laurel Aitken came the year after for the first time, and in 1995 for the second time. Gaz Mayall was also a guest of The Roots Connection in 1995. This was the first time I met Gaz Mayall personally. I met him later again on the Skasplash tour and in 2000 with Der Transformer at Gaz’s Rockin’ Blues in London (find more on the website). 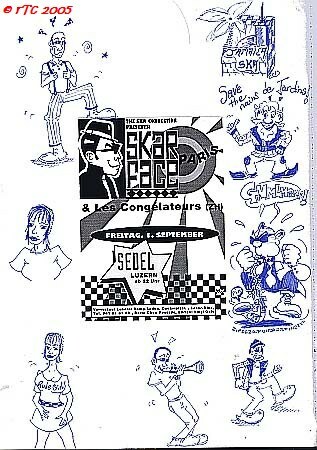 Also in 1995 I invited Skarface from Paris. On the Skasplash tour I meet Fred from Skarface again. 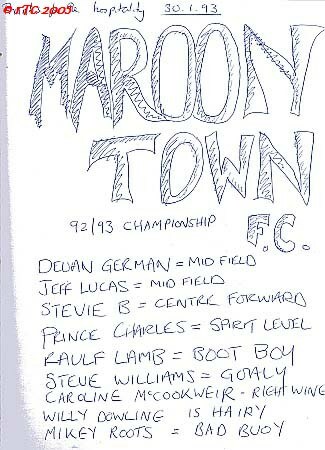 The first time I met Jeff Lucas was with Maroon Town 1993 in Lucerne. 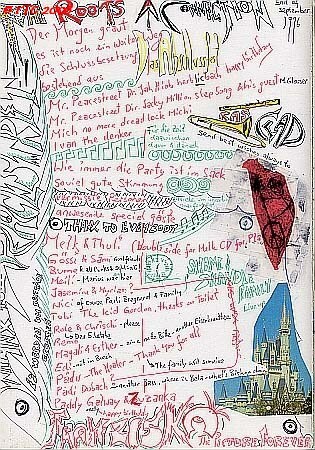 In 1994 he came to Berne with House Of Rhythm. The following year we met again in Lucerne.